Physical therapist Ray Lunasin's day job is to help people recover from injuries or illnesses. But it's how he spends his time outside of work that often brings patients comfort. In Knox Olafson's hospital room, machines beep and hum. But there's another, less mechanical sound as well: the soft strum of Ray Lunasin's guitar. That's the sound 4-year-old Knox is listening to, and it seems to be taking him somewhere far away from his hospital bed. Which is exactly the point of this solo performance. "Music catches your senses," Lunasin says. "It can be uplifting for patients." During the day, Lunasin uses his hands to heal as a physical therapist at Mayo Clinic Health System in Austin, Minnesota. But at night, on weekends, and sometimes during his lunch hour, Lunasin's hands offer a different type of healing by way of playing music for patients like Knox. It all started back when Lunasin was a student in the Physical Therapy Doctoral Program at Mayo Clinic School of Health Sciences. Between classes and clinicals, he'd stop to play the piano and sing in the atrium of the Gonda Building on Mayo Clinic's Rochester campus. He performed pop songs and love songs, contemporary Christian tunes, and familiar hymns. And people responded. "Patients would come up to me crying, they were so touched by the music," Lunasin says. Once, while he was performing Frank Sinatra's "Fly Me to the Moon," an elderly couple stopped to dance. "Music can move people to do so many different things," Lunasin says. Lunasin's first bedside performance also took place during his time as a student. He'd been caring for a patient awaiting a transplant, and he learned the man was a musician. 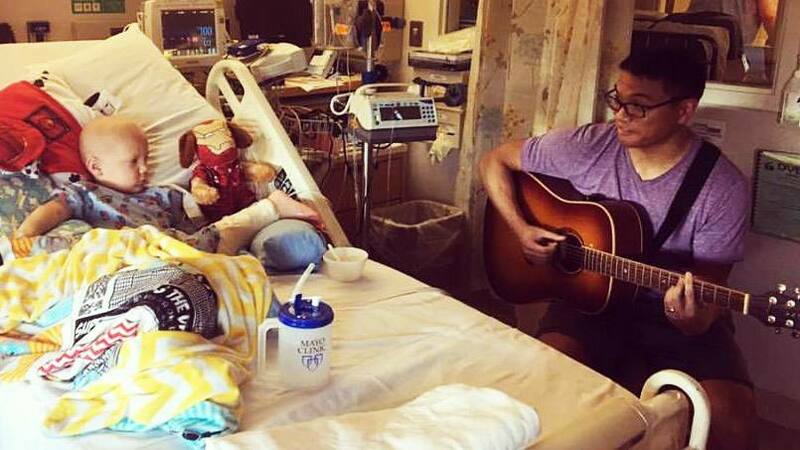 The two got to talking music, and Lunasin offered to bring his guitar to the patient's room and play for him and his family over the weekend. "I spent about two hours playing and singing for them, and it was one of the coolest things I've ever been a part of," Lunasin says. "He and his wife were so thankful. It was the first time I'd played for a patient, and just seeing the smiles that guy had, and how deeply affected he was, made me want to do it again." Lunasin, who tells us his last name means "cure," says music helps him heal, too. "For me, playing music is a stress reliever," he says. "If I've had a hard day or feeling down, I can use my hands to make beautiful sounds, and it's like self-medication." You can make a beautiful sound by leaving a comment below before you use the social media tools atop this page to share this story with others. Learn about physical medicine and rehabilitation at Mayo Clinic. Explore Mayo Clinic's Humanities in Medicine program.